If you’re looking for a professional moving company that has its roots in Northern Utah, then consider Moving Connections. Moving Connections is small enough to be sensitive to local needs, but large enough to provide elite professional service. With experienced moving crews and a whole range of ancillary services, Moving Connections is the logical choice for discriminating residents and businesses. Although Moving Connections is a Moving Company offering varying levels of residential moving services at differing costs, our full service residential move is still our most popular service. Maybe that’s because Utah customers know a good deal when they see one. If you consider the hassles and headaches (and body aches) associated with do-it-yourself moving, then you might quickly discover why so many Utah residents stick with our full service moving option. There are so many last minute details to attend to and so many little loose ends to tie on moving day as it is, so why add to the noise and the confusion and hassles by trying to do yet another huge job? On moving day, your plate is full enough. Not to mention that there might be no small amount of emotional trauma associated with it, such as leaving dear friends and wondering what your new neighbors (or the children’s new school) is going to be like. It gives great solace to many on this nerve racking day to leave the huge job of wrapping, packing, and expertly loading and unloading a moving truck to the seasoned professionals at Moving Connections. 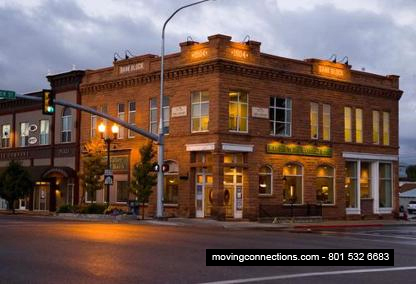 If Moving Connections is moving you to Heber it's a perfect time to begin to utilize the many resources and bounties of Heber. For example click on the picture to the left to go the Moving Connections 'Support - Advice - Assistance' page and discover Heber for the first time. Once you are on the 'Support - Advice - Assistance' page go ahead and open the .pdf link found there and tape the list of emergency and useful phone numbers on your refrigerator. Moving Connections has gone to great pains to find those links and connections to integrate you quickly into Heber life. Moving Connections is a Moving Company offering a budget minded option called the “Labor Only Move”. With this move, you provide the truck and driver. Moving Connections provides the expert loading crew. Two (or more) iron men will show up at your residence at the appointed time on moving day and will professionally wrap, pack, and load your rental truck. From there, you drive the truck and unload it at your new location. This saves you tons of money, because you have reduced our crews’ time on your job by about fifty percent or more, depending on how far away your new destination is. Since Moving Connections only charges for labor/driving time plus boxes and tape, this can be a budget saver for you. Experience: Moving Connections has more than thirty years of experience moving Utah households and businesses, from small office moves across the street or down the hall to full corporate relocations. Best Moving Crews in the business: as a business person, you probably know that the most important person you deal with is the one that you’re face to face with when purchasing a service. That’s why Moving Connections hires only experienced moving personnel. That way, you get someone who knows how to get the job done right and efficiently, and also knows how to work with you, the customer. Professionalism: Moving Connections is federally licensed, bonded, and insured. So we’re totally dedicated to professionalism. In fact, we even have our own car shipping company if you need that service. And we have climate controlled storage if you need it, and we offer conventional non-climate controlled storage space, too. In addition, we offer home staging services, handyman repair services, and even thermal imaging services to check for thermal leaks in your home to ready it for your most advantageous sale of your home. Commitment and Track Record: As was mentioned above, Moving Connections has been providing moving services for more than three decades in Northern Utah with a great record of customer satisfaction. That’s what keeps us in business. And we couldn’t accomplish this (and we wouldn’t have so much customer satisfaction and so many great reviews) without a serious commitment to the highest levels of service in the moving industry.